Eating While Feminist: Kitchen Renovation Cooking Extravaganza! It is SUCH a relief to be able to use all of our house after having kitchen renovations done. That very essential room was cut off for three or four days, and I for one missed being able to work in it. My very fancy tofu in a very fancy bowl. But now... now it's much, much nicer. 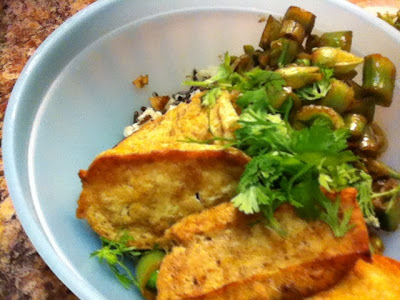 The first day of full operations was Saturday, and to celebrate the occasion, I made a variation of the Seared Tofu with Sugar Snap Peas that appeared in the NYT. I didn't have fish sauce or sesame oil, so I filled in those amounts with soy and peanut oil, and omitted the sesame seeds (same reason). Otherwise, pretty much the same thing. Last night's dinner was a variation of that variation, which turned out to be Orange Chicken (recipe follows). Tonight was the very easy + tasty Fresh Pasta Sauce with a little sauteed chicken and sausage added, and WOW was that good over egg fettuccine. Living in a household with someone who is dieting to lose weight (to increase the success chances of surgery) is challenging in a lot of ways. I have a very long history of not really feeding myself unless I'm feeding others, and I spend most of my day (ergo eating time) out of the house. With dinners being generally low-calorie (and I've never eaten much dinner anyway), I've been having to really take my personal nutritional needs into account, to make sure that I'm not starving myself. So besides cooking AWESOME food at home, I've also been schlepping granola, yogurt, fresh fruit, and other tasty nibbles with me to work, to make sure I eat enough. I'm doing a bang-up job, if I do say so. But! Here's the recipe I promised. Enjoy! but we have certainly not unpacked all the stuff that used to live in it! Using the sauce from Seared Tofu with Sugar Snap Peas as a base, I created an orange chicken recipe. We usually have TONS of greens in our CSA, so this is a good use for that baby bok choy that is so often neglected at our house. Cook rice in rice cooker according to directions, adding butter if desired. While you're waiting on the rice, chop bok choy and slice carrots lengthwise with vegetable parer, making long thin strips; set aside in a bowl. In a separate bowl, combine 1 tsp peanut oil, soy sauce, garlic, ginger, sriracha, sugar and orange juice. Cover and shake or mix until blended. When rice is done, heat pan over very high heat, and spray with canola oil spray, adding 1 tsp peanut oil, if desired. Add onion and chicken, and brown over high heat; when chicken is brown and mostly cooked, add bok choy and carrots. Add additional 1 tsp peanut oil if the pan is dry. 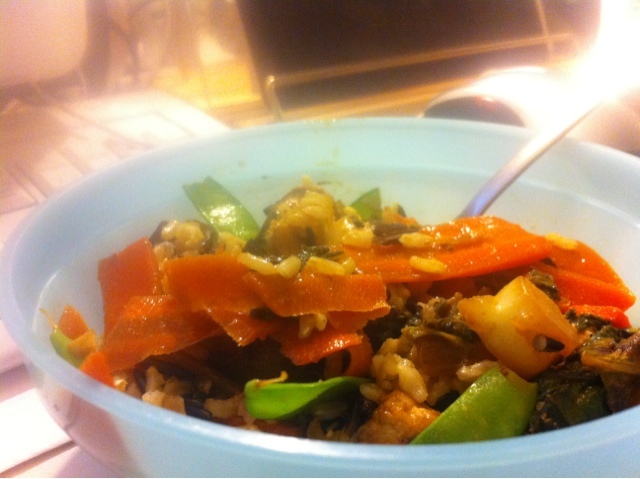 Stir fry until bok choy begins to wilt, about 3 minutes. Add sauce mixture and let simmer until sauce thickens slightly, about 5 minutes. Add snow peas and stir, letting cook 1 or 2 minutes more. Serve over brown and wild rice. Makes 4 servings. I could have sworn I'd posted this before. Well! Now I will! This is a highly customizable sauce. Saute onion and/or meat, throw in veggies, saute until sauce-like, throw over pasta. You can season it however you like, but I like it best when the flavors of the vegetables are allowed to shine through - I do very little more than a sprinkle of salt on top after cooking, although I may throw in some oregano or basil if I have it handy. Heat a pan over medium to medium-high heat, add oil or butter and onion. Saute until tender, then add meat if desired. Saute meat until browned (or continue sauteing onion until browned). Add tomatoes and other vegetables and saute until veggies are tender and tomatoes (whole) split or (chopped) start to fall apart. Season as desired, letting simmer for a few minutes to incorporate the flavors of any herbs you use. Serve over the pasta of your choice, and dig in! Makes about 4-6 servings of sauce.